Users who need to make sure they can get access to files stored in Dropbox while they’re on the go and away from the web have a new feature to help with that. The company announced Tuesday that users of its mobile apps will soon be able to save files locally for use offline. It’s a move by the cloud storage company to better compete with the other players in this space, and provide users with functionality that will help them be more productive when they’re on planes, in low-connectivity areas or just want to save their cellular data quota for other purposes. Here’s how it works: Users select a folder in the Dropbox app, tap “Make Available Offline,” then wait for the app to download the requested files. After that, those files will be available for viewing, even if the phone or tablet storing them is without a connection to the web. The feature is built for people who know they’re going to be off the grid. But to get the latest version of a file, users will have to open the Dropbox app when they’re still connected to the internet, so that it can download the latest revision. The feature is an extension of existing functionality that lets users save files to their smartphones or tablets. The difference is that now users can download a whole folder at once. Google Drive and Microsoft OneDrive also support saving files offline, but don’t offer one-tap downloads of offline folders. 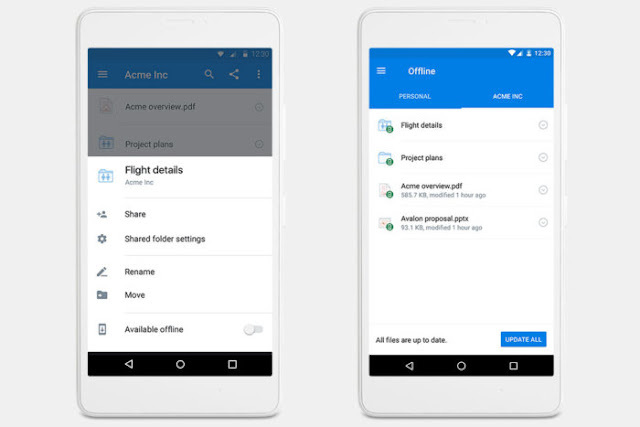 The feature will be made available over the coming days to Dropbox Pro, Business and Enterprise users with the latest version of the service’s Android app. The feature will be coming to iOS early next year.